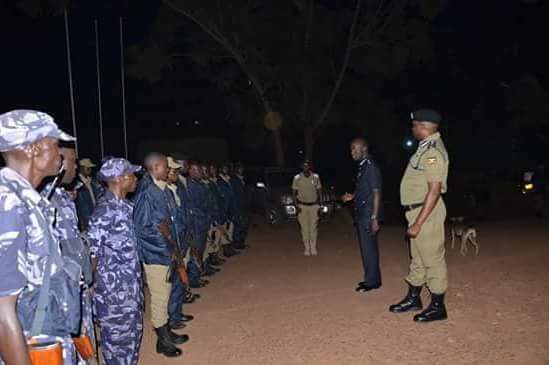 Deputy Inspector General of Police Brigadier Sabiti Muzeeyi today addressed the foot and motorized patrol teams of Kampala Metropolitan Police at 2:00am. The DIGP called upon officers to engage the community in proactive problem solving in order to make a significant contribution towards the enhancement of national crime reduction. Brig. Sabiti shared with the officers about the positive and negative outcomes of the foot patrol strategy. "Am happy and this is the way to go. Patrols help to solve the emerging needs of the community," Sabiti said. He said foot patrols increase police visibility in busy areas, enhance citizens' feeling of safety, build bridges between citizens and helps policemen to have an intimate knowledge of their area. Foot patrols have been around as long as modern day policing itself. Although many police forces discontinued walking beats between the 1920s and 1950s in favour of motorized patrols which were deemed to be more "efficient", the last few decades have seen a resurgence in foot patrols.